If you ask today’s guest, he’d say he’s doing everything possible to make it happen. Chris Toombs is founder and technology manager at FPVLive.TV, a start-up company specializing in live streaming of drone races. On this edition of the Drone Radio Show, Chris talks about FPVLive.TV and the services it offers to local race organizers. [02:06] Origin of FPVLiveTV: Chris got the idea of live streaming drone races after watching some YouTube videos. [02:45] From Idea to Reality: Chris watched YouTube videos to learn about how live streaming was done and he practiced techniques by live streaming drone racing events held by the Drone Racing Club in Atlanta. The Atlanta DRC became Chris’s testing ground as he perfected the live streaming service. [04:07] The Technology. Chris explains the equipment and operational components of a typical live streaming system, the number of feeds uses, where the feed is uploaded and who can view the live events. Users can view the live feed on their computer, tablet or mobile device. [07:48] Challenges. There were two types of challenges to overcome – the technology learning curve and how to produce a show that would be interesting and interfere with the race itself. [09:54] The Company. FPVLive.TV is a startup company, with small group of employees. [10:36] Feedback. To date the company has received positive feedback from users and race organizers. Chris has plans to expand the live streaming to include chat rooms so users can communicate with each other. [12:13] Benefits of Live Streaming. Live streaming of drone races allows people to view a race that they may not be able to attend in person. It provides different perspectives of the race. And, for pilots, it’s a way to nurture and grow a fan base. [12:46] Race Production. Chris handles the race production duties and seeks to create a visual appealing race that viewers enjoy and that do not interfere with the live drone race. Once the race is over, Chris is already thinking of ways to improve the production for the next race. [14:13] Lessons Learned. Chris has learned that the live stream should not interfere with the race, not to introduce anything new into the race without testing it completely first and making sure there is close communication and coordination with the race director. [16:00] World Drone Prix. 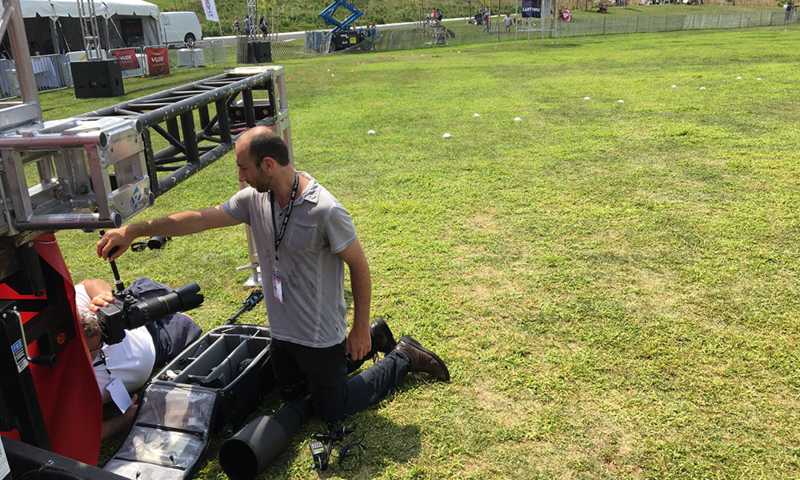 Chris offers his insight into the production of the live stream used for the 2016 World Drone Prix based on this experience and lessons learned. While praising the overall effort, the production had several periods of dead air and some other miscues that Chris experienced during his learning curve. [18:44] Live Streaming Schedule. Generally, Chris livestreams every two weeks. There are many drone race clubs that want to have their races livestreamed, but since drone racing is in the early stages of development, funding for live stream services is rare. Sponsors offer the best hope at this time. Some of the races attract upwards to 600 people while the number tuning in to the live stream has reached the same level. [18:44] The Business. The plan is that demand for live streaming services will continue to grow as will the number of sponsors, which will open the door for FPVLive.TV to grow as a profitable business enterprise. [18:44] Competition. While most race clubs try to live stream some of their events, FPVLive.TV seems to be the only company that is consistently live streaming drone racing events on a regular schedule. [23:18] FPVLive.TV Commitment To Service. FPVLive.TV will stream to at least 3 locations, with the ability to add more if they’re available. They will provide up to 8 camera feeds, do all of the post production, add sponsor logos, include pilot information, and provide the race commentary. [24:15] Impressions. After seeing so many races, the two things that stand out most for Chris is that pilots are getting good at drone racing and mastering the course and, second, the race teams are very cordial and helpful to each other during the race. There is a high degree of comradery. [24:10] The Future. Chris’ hope is that one day; FPV Racing will be on television. To remain competitive as interest in drone racing grows, Chris feels they need to (1) provide consistent, dependable service, (2) they will continue to have a high quality production value in delivering the race content to viewers and (3) they will integrate new technologies to continue to enhance the view experience. [28:01] Final Comments. Chris invites listeners to follow them by watching the live feeds.